Dr. Lynn Griebahn always appreciates feedback from his valued patients. To date, we’re thrilled to have collected 16 reviews with an average rating of 4.94 out of 5 stars. Please read what others are saying about Dr. Lynn Griebahn below, and as always, we would love to collect your feedback. Great office! Clean and quick and keep the teeth in check! 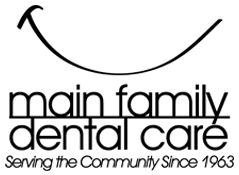 Great experience with the dentist and staff at Main Family Dental. My husband and I and our 4 children had cleanings and routine xrays and our care was handled quickly, kindly and professionally. My 12 yr old needs some extra things done in 6 months and our treatment plan was explained to us so I understand the benefits of the planned treatment. Will return! Best Dental Practice Hands Down. Staff are timely and professional. Excellent service. Everyone at the office is super friendly and caring. It makes going to the dentist enjoyable! Fast and easy. Made me feel comfortable in the process. Professional service and relaxed atmosphere. Great staff, and Lynn is one of the best dentists you can find! Dr was able to get me in on short notice and get my issue fixed quickly. Very pleased with the care I received. Very understanding and we look forward to working with this practice. This was my first visit and I must say I felt at home. Customer service was a 5 star. Doctor and his support staff very knowledgeable and secure in their decision making.. They went over my diagnosis, cost and let me make my on choice.. they were open for me getting a second option if needed.. I am a very happy patient.. I highly recommend them if you are looking for a new Dentist.. I brought my daughter to Dr. Griebahn for her first dental appointment, and was sincerely impressed by the professionalism and skill he and his staff exhibited while treating my 5 year old. This is the most honest and fair dentist I've ever seen. Smooth, friendly, timely, and informative. Looking forward to future visits, which is crazy to say about a dentist but they are that good.